Christian Wiman, a poet known for his meditations on mortality, has long been fascinated by joy and by its relative absence in modern literature. Why is joy so resistant to language? How has it become so suspect in our times? Manipulated by advertisers, religious leaders, and politicians, joy can seem disquieting, even offensive. 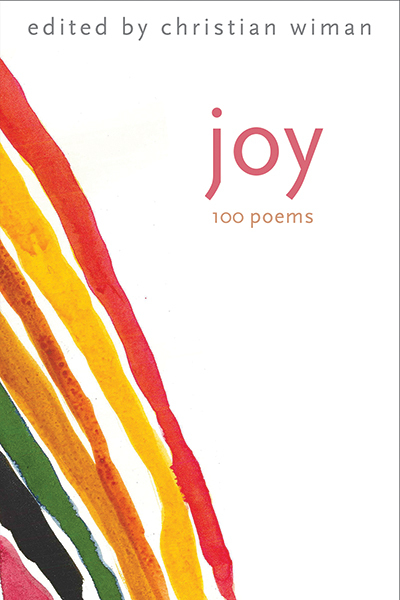 How does one speak of joy amid such ubiquitous injustice and suffering in the world? In this revelatory anthology, Wiman takes readers on a profound and surprising journey through some of the most underexplored terrain in contemporary life. Rather than define joy for readers, he wants them to experience it. Ranging from Emily Dickinson to Mahmoud Darwish and from Sylvia Plath to Wendell Berry, he brings together diverse and provocative works as a kind of counter to the old, modernist maxim “light writes white”—no agony, no art. His rich selections awaken us to the essential role joy plays in human life. Christian Wiman is the author of numerous books, including My Bright Abyss: Meditation of a Modern Believer. He is professor of the practice of religion and literature at the Yale Institute of Sacred Music.